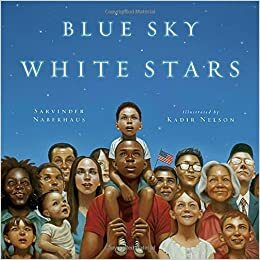 Summary: A few words of text on each page celebrate the American flag and the people of the United States. On the left-hand side of each spread is a picture depicting an American landscape or icon; the facing page has to do with the flag, or has a flag as part of a picture. For instance, “white rows” shows a line of covered wagons traveling west on the left, and the white stripes on the flag on the right. Some of the phrases are homophones, such as Betsy Ross sewing the flag, described as “Sew together/won nation”, accompanied by “So together/one nation” showing a diverse group of Americans. Includes notes from the author and illustrator. 40 pages; for all ages on the Fourth of July. 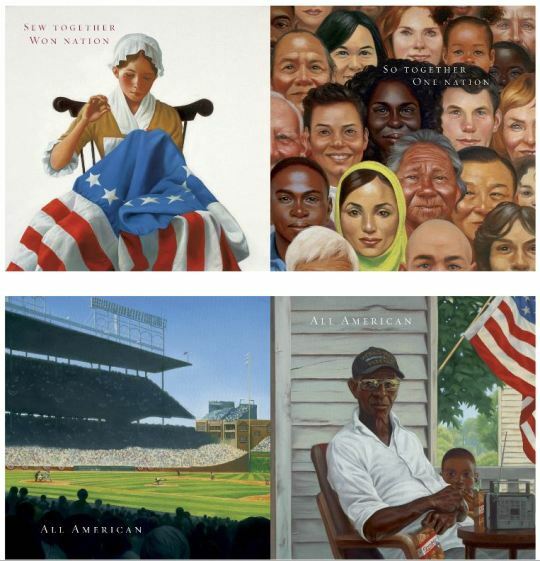 Pros: A beautiful and patriotic tribute to patriotism, with gorgeous, multicultural illustrations by award-winning Kadir Nelson. Cons: Even this lovely book couldn’t quite pry the CNN-wrestling tweet out of my head.